This program draws a wind rose diagram. A wind rose diagram shows the frequency, speed, and direction of winds over some defined period of time. It is widely used in meteorological applications (see here:). Data to test the program (in SAMPSON formatted data files) can be freely downloaded from the Meteorological Resource Center. Changes made to the program in Oct 2014 allow multiple windrose plots to be placed in a graphics window, but with a few reservations. Windrose plots normally have an aspect ratio of 1 (i.e., they are square). Unfortunately, this cannot be guaranteed if you use !P.Multi to create multiple plots. Therefore, it is recommened that you use cgLayout to obtain a multi-plot layout for multiple windrose plots, and give each plot a specific position in the graphics window with the Position keyword. An example of how to use the program can be found in the Coyote Plot Gallery. Copyright (c) 2013-2014, Fanning Software Consulting, Inc. Written, 7 March 2013 by David W. Fanning. Fixed error in which I was assuming some calm winds. 23 May 2013. DWF. Added LegendPosition, Position, CircleLabelSize, and NoLegend keywords and made changes that allow multiple windrose plots to be place in a graphics window. To better accommodate multiple plots, the cardinal directions are now indicated with a single letter and the default circle label font size is reduced. 22 Oct 2014. DWF. This function returns 100 x and y points as a 2x100 array that forms an arc between two angles when plotted. This is a tick labeling function that prevents negative tick values. Read a SAMSON format meteorological data file to obtain the wind speed and direction arrays. 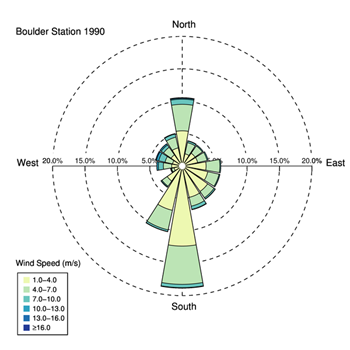 Draw a wind rose diagram from the input wind speed and wind direction parameters. This function returns 100 x and y points as a 2x100 array that forms an arc between two angles when plotted. The arc is created as if the 0 angle was to the North (top on drawings). The X center of the arc. The Y center of the arc. The radius of the desired arc. The first angle. The arc is drawn between the first angle and the second angle. The second angle. The arc is drawn between the first angle and the second angle. This is a tick labeling function that prevents negative tick values. It also labels all tick values as precentages. Set this function as the name of either the XTickFormat or YTickFormat keyword on a Plot or Axis command. This is not called directly by a user. The type of axis. 0 is X, 1 is Y, etc. The index of the tick label. The tick value to be transformed by the function. The path to a SAMSON (*.sam) format meteorological data file from which wind speed and wind direction can be obtained. The wind speed as obtained from the file. The direction of the wind as obtained from the file. 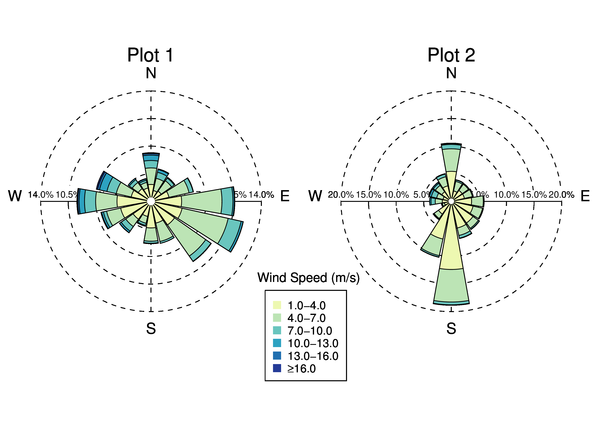 Draw a wind rose diagram from the input wind speed and wind direction parameters. The wind rose diagram treats a 0 angle as pointing to the North, or toward the top of the diagram. Note this is different from normal IDL coordinate systems, which treat the 0 angle as pointing to the right of the diagram or plot. The wind speed array. Note that missing values should be removed prior to passing the speed array to the program. This vector should have the same number of elements as the direction array. It is assumed there are no negative speed values in the array. Winds assumed to be measured in meters/second. The direction of the wind. This should have the same number of elements as the speed array. The wind directions are assumed to be in the range 0 to 360. A multiplier of the default character size, used for labelling the circle percents. A two-element array giving the X and Y position of the top-left corner of the legend box in normalized coordinates. By default, to the southwest of the windrose plot. Depending on window size, etc., the legend may not be visible or may be only partially visible. Adjust either the size of the window or the location of the legend for improved visibility. The usual four-element POSITION keyword giving the plot position of the windrose plot in normalized coordinates. The size of the bin when the speed is binned with the Histogram command. The plot title. Not displayed if a null string.